Are your kids always bored? Other moms always seem to plan more entertainment for their kids. More outings. More playdates. More crafts. More activities. But your kids? Just not happening. And listening to that “super mom” gush about this week’s trip to the art museum, library read-aloud time, children’s play, dance class and piano recital… it just kinda makes you feel guilty for not doing enough. Then your kid says those dreaded words. “Mom, I’m BORED.” Are you failing? Yes your kid is bored. While cleaning up the yard, I rolled a hula hoop-sized metal ring towards the kids. “Here you go!” It rolled 10 feet across the grass, wobbled in a circle for a second, then fell over near their feet. What does it do? I she serious? It’s awesome, that’s what it does! There are a MILLION different things she could do with it! “No movie until after naptime. I’m sure you can think of something to do.” I went back to filling my trash bag with old shingles. A few minutes later, my bored kids were squealing with delight as they took turns throwing a ball through the metal hoop. With packing up the “stuff” to move, it’s starting to feel a bit like camping in our house. Only the essentials. I had been keeping some of the kids’ toys out, to keep them entertained. But as move date approaches, the littles are getting increasingly more stressed and less cooperative. Which left me picking up their toys. Over and over. And over. Finally I just got tired of it and packed away all the rest. Now they both have their teddy, their tricycle, and a half dozen books. That’s it. You know what? The play has been magical. They seriously spent over an hour playing with a letter envelope yesterday. They played mailman. They put it in the oven to “bake pizza.” They played police on the tricycles, with the envelope being a speeding ticket. The envelope was an injured bird they nursed back to health. And on and on. Then they moved on to a Dada’s flip-flops. Doing an activity for himself, left to his own devices, with no adult waiting for an outcome, is not something many children get to experience often. But this is where internal motivation comes from! “I think you two are the most interesting people I know.” one of our church friends recently said about my husband and me. Which I thought was hysterical because I’m pretty much the biggest homebody ever. Seriously, we’re sticks in the mud at any “normal” social event. We don’t really follow the news. I couldn’t tell you which sport is even in season. The only reason I knew our local baseball team -whatever their name is- won the world series was the neighborhood fireworks woke me up. BUT… we’re always doing something weird. We bought a cash fixer-upper home… without running water. There was Aunt Mildred… A duck who lived in the bathtub. We’ve self-published a children’s book. 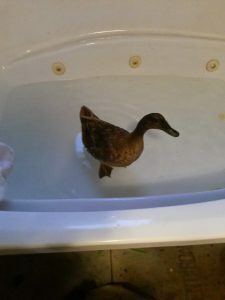 I gave birth at home, in the bathtub, twice… Not with the duck. Now we’re moving across the country, with our belongings in a shipping container pulled behind our SUV. I attribute most of our quirkiness to the fact that we were allowed to be bored as kids! Long before we knew each other, we were both spending hours and hours working on whatever weird projects we found interesting. Making rafts, treehouses, poetry, woodworking, costume design, keeping animals etc. Now as adults, we’re still doing weird, geeky projects, just because we want to! In Little House in the Big Woods, Laura and her sister are stuck in a tiny, 2-room cabin. All winter long. They don’t have piles of toys. They don’t have endless shelves of books. They have very little… other than each other. How do they pass the long winter months? Playing with a thimble. Hiding it. Finding It. Is a thimble really interesting enough to keep a child occupied that long? Of course not! But her sister is. When children aren’t being constantly stimulated and entertained, they learn to rely on one another. When adults are bored, it often leads to temptation and sin. Laziness, gluttony, poor choices, immoral entertainment, bad habits. But young children aren’t yet capable of sin. Mischief, yes. Messes, yes. Inconvenience, yes. But nothing really bad. It is so tempting to try to always keep our children entertained, just do they don’t cause us trouble. But if they never experience boredom now, what is going to happen when they are teens? Young adults? 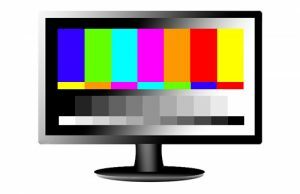 When we aren’t able to provide constant entertainment anymore? If they haven’t learned how to deal with a lack of stimulation, if they haven’t developed their own resourcefulness, then they are at risk of falling into shiny, stimulating temptations. So, when would you like your child to learn how to handle boredom? Now, when the biggest risk is a messy house? Or as an adult, when they can get themselves into serious moral trouble? How do we protect boredom? Kids don’t need to be in ballet, softball, gymnastics, piano, karate and cake-decorating class! Pick ONE. When they get tired of it, move on to the next one. But only one at a time. Or, don’t feel bad if these activities just can’t be part of your family! My husband’s family just didn’t have the resources for these kind of classes, and that’s fine! Give the kids a “teach yourself piano” book or a “Karate for Beginners” DVD, and let them teach themselves… if they want to. Schedule all errands, outings and activities for the same few days. Leave the rest of the days free. Designate these “wild days.” Like a wild card, these days can become anything. But the rules are: No outings. No extra chores planned (this is not a yard work day.) And if you homeschool, consider having these days school-free, or at least a lighter school load. Not always. Not even mostly. And never for true needs. But it’s good to let our children know sometimes that Mama is busy right now, unavailable to play with them, and they need to occupy themselves. They can help with whatever work Mama is doing, or they can go find something else to do. Consider having screen-free blocks of time, like to screens before 4pm. Or even screenless days. Especially a weekly screenless Wild Day. Don’t plan never-ending crafts and projects. We can all blame preschool for this one. And Pinterest certainly doesn’t help. :p Now, our generation of mothers all feel like we are supposed to do constant craft projects with our preschool-age kids. Popsicle stick puppets, handprint turkeys, footprint snowmen. Crafts for every season and holiday. It is ridiculous. Pat yourself on the back, Mama. You’re helping them build character! ← Giving in to My Child – Will it Spoil Her?